Internet media company BuzzFeed on Dec. 1 published a document detailing Facebook’s relationship with Definers Public Affairs, the Washington D.C.-based research firm the social media giant allegedly hired to link a high-profile anti-Facebook campaign to billionaire philanthropist George Soros. The group calls on the Federal Trade Commission to break up Facebook-owned services WhatsApp, Instagram and Messenger into separate units in the hopes of giving users more control over their data. It was formed by at least a half-dozen progressive groups, including the Open Markets Institute, MoveOn Civic Action, SumofUs and Citizens Against Monopoly. 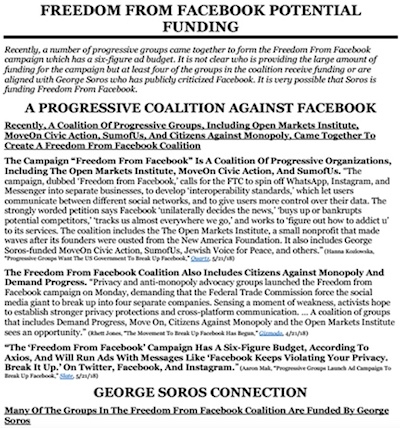 The document includes a section labeled “George Soros Connection,” which examines Soros’ alleged financial ties to Freedom From Facebook members MoveOn, The Open Markets Institute, SumofUs and Citizens Against Monopoly. Political, business, tech website Axios in November reported that the “initial donor” behind the Freedom From Facebook campaign was David Magerman, a Pennsylvania philanthropist and former hedge fund executive. Magerman has reportedly given more than $400,000 to the campaign. Schrage, who came under fire for Facebook’s response to the Cambridge Analytica scandal, announced he was stepping down in July. He will be succeeded next year by former UK deputy prime minister Nick Clegg. Facebook declined BuzzFeed’s request for comment to the story.